The last time the valley was this heavily veiled in smoke was the Rim Fire of 2013. The smoke and ash from the recent fire’s caused more than a few to cancel their trip into Yosemite. But, J & C stayed the course. 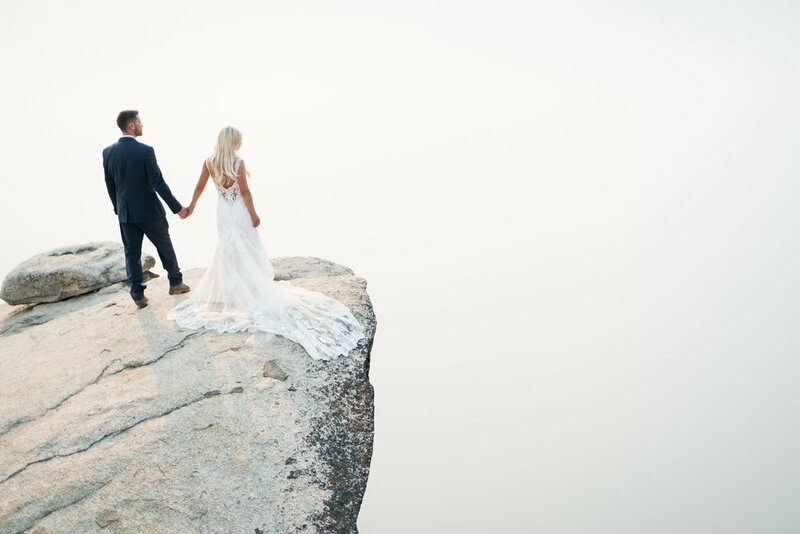 Hand in hand on a ledge overlooking the valley floor, the couple wed beneath smoke-white skies. We were able to capture their union in front of an unexpectedly stunning backdrop. 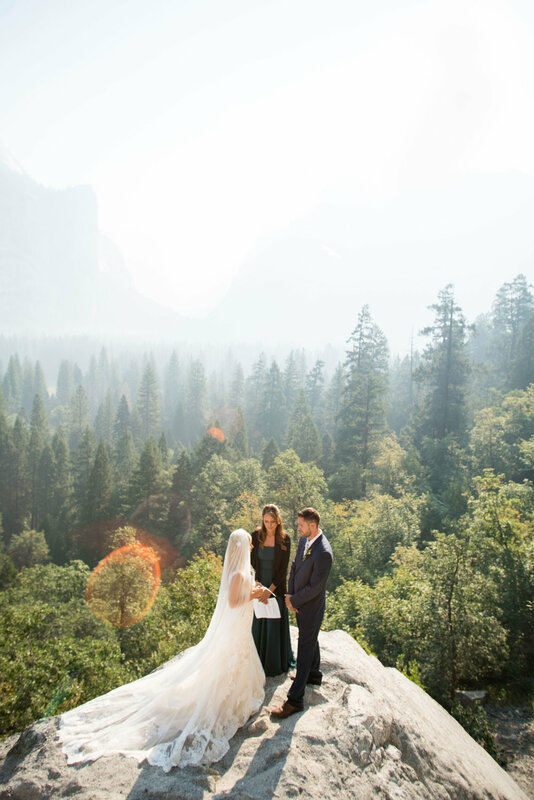 From there we focused on capturing candid shots of the newlyweds while we showed them some of our favorite, lesser known Yosemite spots. And we might have repelled off a 3,000 foot ledge to grab some of these shots, since we love getting a little rock climbing in, any chance we get. Occasions that occur once a lifetime should be planned to perfection and well documented. Me and my “wife” decided to elope in Yosemite, CA with no prior experience in that area. We wanted a stress-free experience to embrace our union freeing ourselves from worry or concern. It was quite easy to locate many photographers that would fly in or that even lived close. We started to narrow down the choices by the quality of their webpage photos; and of course, price. I originally wanted to go with another (cheaper) option who’s photos were something out of a magazine. My “wife” Jenn decided we should call our top choices to “feel them out”. I would have easily said yes to any of the first 3 based on professionalism, photography knowledge, and just felt comfortable. We spoke with Damian and Trev last. To be honest, I was caught off guard with the ideas they were proposing. They were motivated to capture original shots never taken before. Let me back up; Damian is a Native American rock climber from this area. Trev also actually lived in Yosemite and has climbed “every inch” of the park. They went into explaining the tourist problems and difficulty getting the shots in crowded areas. Every suggestion we had (just from googling Yosemite elopement pictures) was immediately expounded on with intimate knowledge, secrets, and hidden paths. They won us over with their immense detailed information of the whole day (yes, the whole day; sunrise to sunset). The question you need to decide on is; do you want a picture like any Yosemite wedding; or, do you want an original magazine cover! 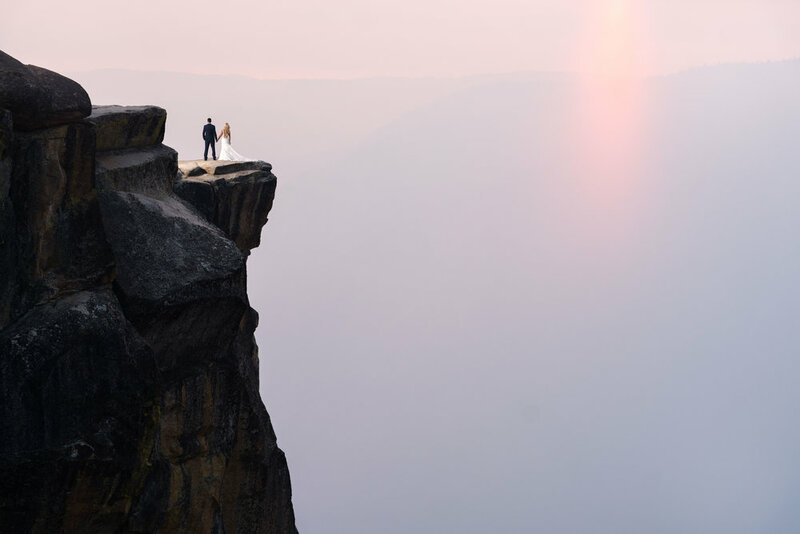 Let me explain, one of the shots on Taft Point was a parking lot of tourists. It was packed with many photographers, hikers, and models. It was stressful to even walk by. Damian and Trev led us past the crowed about a mile and went through the woods to find ourselves closer than anyone else. They began to grasp everyone’s attention as they put harness’s on and began to repel from a 3,000 ledge. Other wedding groups were already positioned and waiting in line for the spot you see in every Taft Point picture. I could almost smell the jealousy of them as they witnessed us approach the far ledge seemingly untouchable. Damian and Trev took time to go over safety protocols and made sure we felt comfortable. They truly accomplished the impossible and made our elopement a perfect experience. I could explain these guys as adrenalin driven extreme photographers; but I wouldn’t want to misrepresent them. They are actually even keeled guides. I would describe them as ornithologist’s, botanist, with local Native American history knowledge. Damian had us tasting leaves that remedy pain, drinking out of “the cleanest natural spring in Yosemite”, describing thousand year’ old holes in boulders used to crush acorns, jumping in rivers, and so much more. These guys pick up where the trail ends. By the end of our trip, I like to think we all became friends. I look forward to them visiting Florida! I’ll close with, money well spent!